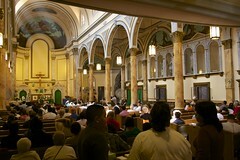 Mr. Moses said his group will once again ask the Landmarks Preservation Commission to consider protecting the church. The Preservation Initiative, along with the Greenwich Village Society for Historic Preservation, is also requesting a meeting with Mr. Steiner, who bought the church property for $41 million two weeks ago. Mr. Moses said he wanted to see the “desires of the community” incorporated into the developer’s plans, which call for an 80/20 percent mix of market-rate and affordable housing. “In terms of preservation, we’d like to sit down with him in a positive spirit to discuss this challenging but potentially extremely rewarding development,” he said. Yesterday, Diana Timmons, who has lived steps away from the church since 1983, mailed a letter asking the Landmarks Preservation Commission to evaluate it. “I am outraged that I have to go to the L.P.C. 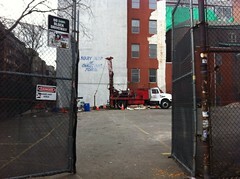 on this,” she said, adding that the Commission should have proactively sought out the site as a landmark. Ms. Timmons would like to see both bell towers preserved along with the building’s façade. But she realized her plea faced tough odds: the Commission has already turned down two similar requests. According to the letter, the church was designed by Nicholas Serracino, the “architect of choice of the Catholic Archdiocese of New York at the time,” in an Italian Renaissance Revival style inspired by the Basilica of Mary Help of Christians in Turin. “He deftly borrowed from that building’s defining features, including its pedimented façade, Corinthian columns, central wheel window and flanking, and copper domed bell towers,” the letter stated. 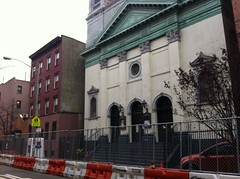 Mr. Serracino, trained in Naples, also designed the now landmarked Church of Saint Jean Baptiste on East 76th Street. But Robert Tierney, the Commission’s chair, responded that the building would not be recommended to the full Commission for landmark status because it didn’t meet the criteria for designation. The reasons were unclear: “We received nothing other than the letter,” Andrew Berman, the executive director for the G.V.S.H.P., told The Local. Mr. Berman, who said the loss of the church would be “tragic,” was disappointed that the buildings wouldn’t be considered. “They are the very definition of a landmark,” he said. “In a fair world, they would have been landmarked; that did not happen. I think the best hope is that Mr. Steiner can be convinced to do the right thing here.” He and other preservationists are seeking “a thoughtful conversation” with the developer about various facets of the buildings “that could possibly be rescued and preserved,” he said. Mr. Steiner declined to comment. A source close to the project, who did not want to be named, said it was too early to know what the developer’s plans are for the site.